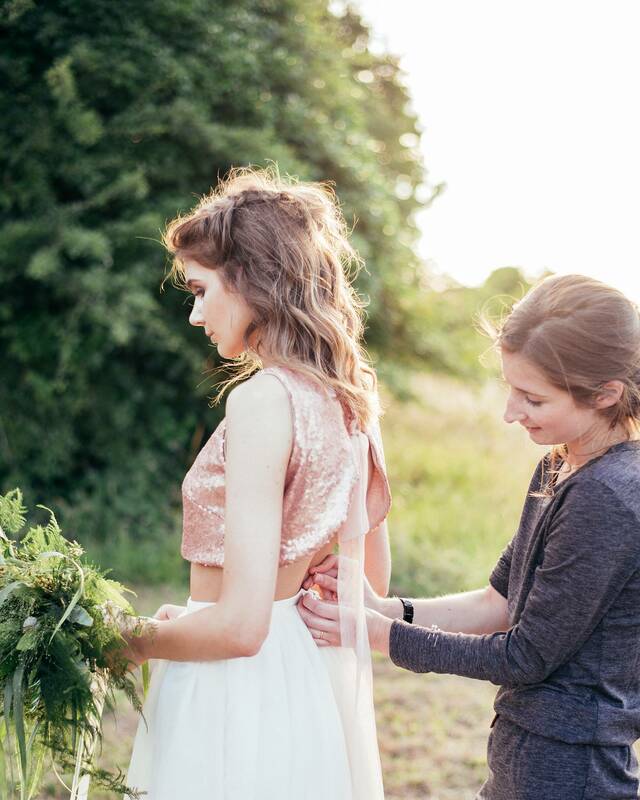 With over 6 years experience from working in couture studios in London I can help create a completely individual wedding dress or Bridesmaid dresses. We can work together to source the perfect fabrics to complement your chosen style and take time in making your big day perfect. I am always flexible to my clients needs and budgets in producing their bespoke dress. From the initial measuring right through to the final fitting, I endeavour to make the process as simple and stress free as possible. My process is simple; bring along your ideas, images or swatches. If you don’t have any don’t worry, I have all of the latest silks and fabrics to hand in my studio. We will then work together to choose the perfect material for your special day allowing you to be as hands on or hands off as you would like to be throughout the entire process. I always allow enough time in the schedule to have as many fittings as you need so your dress fits you perfectly with the flexibility to refine as we go. This results in a completely unique and utterly beautiful dress fit for your wedding day. French Lace and Silk Bespoke Wedding Dress with Covered Buttons. Heavy silk backed crepe jumpsuit with tie detail back. Silk and lace crop top with low back and clean edge finish to the lace. Lace and silk cotton boho wedding dress with frill sleeves. Silk and delicate Chantilly lace separates outfit. Wax cotton circle bridesmaids skirt all to match. Silk crepe skirt and fringed detail lace with low back and silk covered buttons. Satin and French lace dress with heavily beaded belt. Silk crepe and delicate lace boho style dress with slit at the front of skirt. French lace and satin bodice with scallop edge and small sleeves. French Lace Bespoke Wedding Dress with Silk. Sky blue tulle and satin bridesmaids skirts. Fit and flare silk skirt with matching lace crop top with cap sleeves. Silk crepe halter neck fitted dress with keyhole detail at the front. Stretch lace and jersey wedding dress with detachable cape and scalloped edge slit at the front. Rose gold sequin crop top with tulle tie at the back and chiffon and net gathered skirt. Satin boho maternity dress with empire line and low front. Lace and silk cotton dress with sheer back and button detail at the front. Silk satin dress with cutout detail filled in with lace and buttons down the centre front. Chantilly lace scalloped edge detail with cap sleeve. French Lace Bespoke Wedding Dress with Silk Chiffon Skirt. French Lace sleeve with Ivory Covered Buttons. Bespoke Handmade French Lace Wedding Dress with Crepe De Chine Skirt. Heavy silk backed crepe jumpsuit with wide leg detail. Silk crepe jumpsuit with unique tie back detail.